Daylite 5 is a centralized, comprehensive business and contact management application designed to help you and all your employees keep tabs on your current business, prep for new business, and make sure you don’t miss a trick when it comes to everything from client birthdays to project management. Daylite is designed to be used on every device you use. Marketcircle offers apps for iOS and Mac OS, each of which is designed to take maximum advantage of the size of the device you’re using. No matter what device you’re on, your first look at Daylite may be a bit overwhelming. 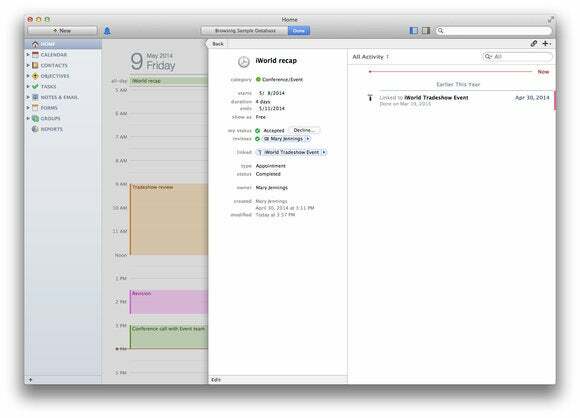 The application is a combination calendar, contact and task manager that integrates with Apple Mail and a dozen or so other applications. As a result, figuring out where or even how to begin using Daylite is a bit daunting. Marketcircle offers a significant number of tutorial videos and recorded webinars on its website, but they’re not very well organized and none of them take you through a “best practice” sequential setup process. Also, the current documentation linked via the Help menu is for Daylite 4, which doesn’t exactly match the features being offered in the new version of the application. Daylite's Home screen gives you a comprehensive view of everything you currently have on tap for your business. 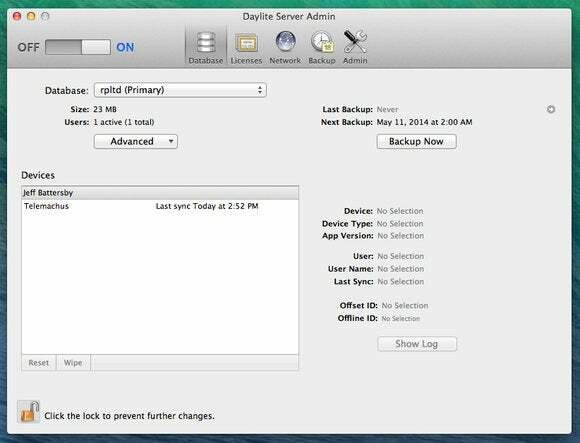 Daylite requires a database server, which means you’ll have to have a computer dedicated to host your Daylite database. You can choose to do this yourself or you can use a service such as macminicolo.net’s Daylite Hosting service. If you do choose to host your own database you’ll want to have an Internet-facing server and a registered domain name to provide easy access for your users. Marketcircle doesn’t charge for server licenses, but you will need a license for every user you expect to have access to the Daylite database. The upside is that you don’t have to pay for any of the applications; each user can use Daylite on every device you provide or they own. Setting the Daylite server up is simple and takes just a few minutes. Marketcircle offers a 30-day demo with just one user if you want to take the application for a test run. With no real guidance on where to start, I began by importing users and calendars from Apple’s Contacts and Calendar apps. Importing requires that you first export a selection of contacts from the Contacts app and specific calendars from the Calendar app. Importing Contacts into Daylite was a snap, but importing calendar items resulted in some unexpected behavior—I ended up with about 40 new contacts, roughly the number of calendar events I imported, and most of which were me and each of which had some calendar event associated with it. There were more than 20 duplicate contacts of me created and it was a bit of a mess to clean up. It’s not the kind of thing you’ll have to do more than once. But, depending on how many users you have to import calendars for, you could have quite a mess on your hands. Daylite's Mail app extension makes it easy to link your mail messages to Daylite businesses, contacts, projets, and opportunities. I was pleased to discover that I could link contacts together in varying hierarchies within organizations. For example, if you have one company with multiple locations and individual contacts at each of those locations, you can create a record for the company’s main office, link it to your contact in that office and then create links to each of the other offices and each of those offices related contacts. Daylite offers several ways for you to link contacts to companies, either using the link menu that appears in the upper right-hand corner of the of the contacts window or by dragging a contact or company on top of another contact or company with two contacts windows open. Once you have your contacts set up you can go about putting Daylite to the real work of tracking tasks and projects and turning them from opportunities into income. Creating a project is really nothing more than creating a container for what you plan to do and then placing things into that container that will help you get from the initial idea to the completed project. Projects can have associated contacts, managers, companies, email messages, notes, letters and most anything else you want to have linked. To help you do this Daylite offers tools to quickly move and link items from Apple’s Mail app to Daylite. When you install the Daylite app it also installs an email extension that lets you take any email message and link it to existing projects and contacts within Daylite. As you link projects and clients, add tasks and calendar items, Daylite’s Home screen displays everything you have on tap for a given day or week. Double-clicking an item on the home screen reveals a small overlaying window that allows you to view and manage the details on the item you’ve selected and allows you to make changes or updates to the project, task, or contact. One of Daylite’s new features is a reporting tool called Insights, which gives you a broad view of all that’s going on in your business. Using Insights you can see how many open opportunities you currently have, how many you’ve won, lost, or are waiting to complete. Daylite also offers reports that let you see see everything from a list of clients with birthdays in a given week to incomplete tasks organized by project or opportunity. Daylite requires that you use a free, easy to setup server application for storing your data. Initial import issues and weak documentation aside, Daylite is a great tool for organizing and managing every aspect of your business projects and relationships. The program’s ability to capture mail messages, link multiple contacts and businesses together, and gather all the information necessary to make the most of every business opportunity and keep your present and future clients satisfied.